The study justifying substantial increases in Austin’s police staffing doesn’t present any evidence that its recommendations are the most effective way to reduce crime. 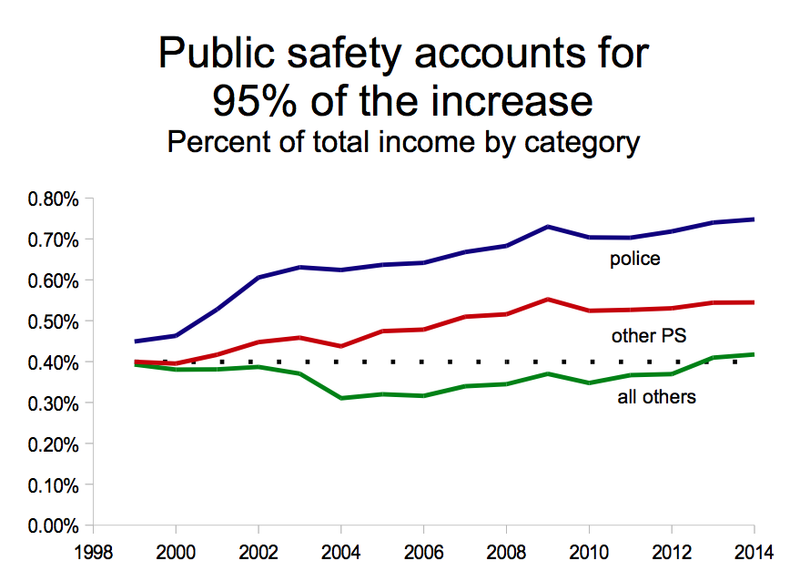 Public safety has grown dramatically as a share of total City government spending. The shift happened between 1995-2005. This table is from the 2005 City of Austin Comprehensive Annual Financial Report. In 2012, the Police Executive Research Forum (PERF) wrote a police staffing document that is the present-day justification for significant “sworn” (i.e. personnel that carry a badge as opposed to a clerical or information technology worker) staffing increases at the Austin Police Department (APD). While the document (PDF) is 133 pages long, it doesn’t explain how its recommended staffing boosts will increase public safety outcomes and simply assumes that more staffing and greater “uncommitted time” should be a policy-making goal. Here are the five key points the study makes that Austin residents should know. Previously, the Austin City Council chose to accept the “2 sworn officers per 1,000 residents” folk metric. The two-per-thousand metric was politically powerful because it was constantly invoked at a time when crime was decreasing in Austin. “Why mess with success?” was probably the thought driving policymaker acquiescence. That said, the PERF study points out that said metric doesn’t have any objective, empirical basis and should not be used as the rationale for police staffing. Given the national trend towards lower crime (PDF), as well as the aging and “gentrification” of Austin, it’s likely the two-per-thousand ratio got a lot of undue credit. This is troubling. Said metric was consistently the “best practice” cited to justify a significant run-up in the share of of the City budget and Austinites’ personal income that APD consumes. 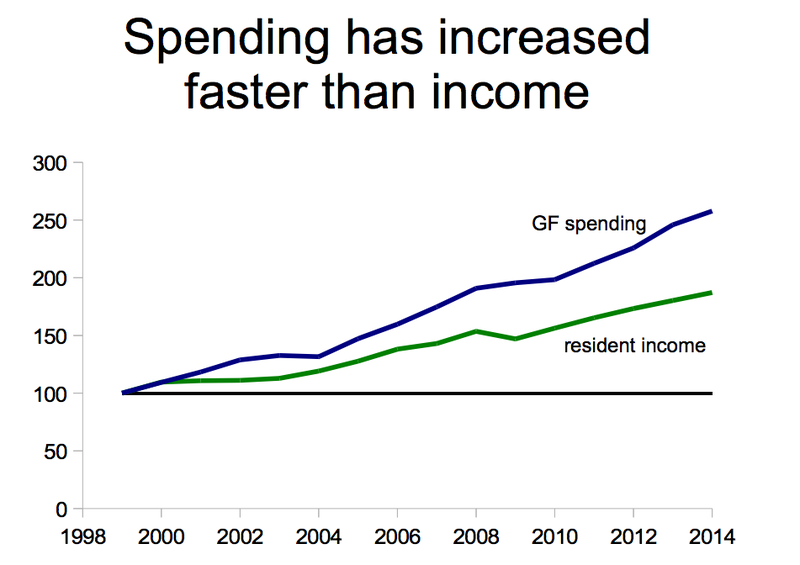 The City’s general fund spending has increased faster than the median income. And most of that increase is the result of police department spending, according to former Council Member Bill Spelman’s analysis (PDF). As a result, policymakers should embrace a more rigorous stance when vetting police staffing. It would be unfortunate if City Council simply substituted one unproven rule-of-thumb for another one that is even more costly. The PERF’s study’s most costly recommendation is to increase patrol staffing to achieve 33% uncommitted time alongside 45% of a patrol officers’ time spent on responding to calls for service (CFS) and 22% on “self-initiated” activity. 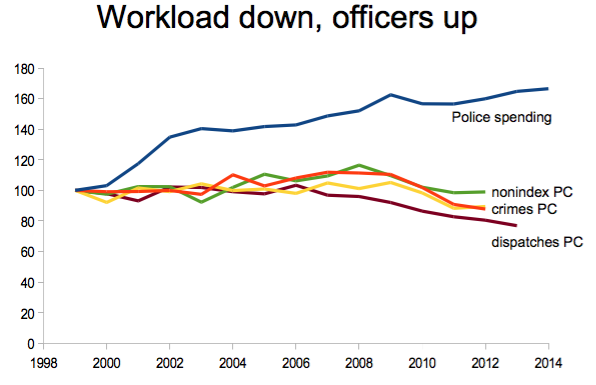 As of 2012, patrol officers spent 57% of their time on CFS, 21% on self-initiated activity (e.g. initiating a traffic stop), and 22% on uncommitted time. And that’s pretty much it. There’s no evidence that departments with this ratio of activity perform better on crime reduction. Not a single study or benchmark or chart is provided indicating that this allocation is superior. It is simply asserted, much in the same way the the two-per-thousand ratio was. The new PERF staffing recommendations actually create a 2.11 officers per 1,000 residents ratio, exceeding the two-per-thousand ratio. A rigorous approach to police spending would examine opportunity costs to determine the most productive use of public dollars. Is additional patrol spending superior to, say, targeted programs such as after-school activities or post-incarceration support? Marginal value-added is not a concept entertained by the study (or Austin’s recent public safety budget spending). Given the importance of CFS to patrol work, it was odd that the PERF study didn’t feature any data on the number of calls handled over time. As former Council Member Bill Spelman pointed out (PDF), dispatches per capita decreased over the last decade. It might be a wise use of patrol time to have longer, higher “quality” responses to calls. Or perhaps the nature of the calls being handled has changed. But by skipping an analysis of trends in calls for service, the study leaves it unclear what a sensible linkage between calls for service per capita and patrol hours consumed per call might be. 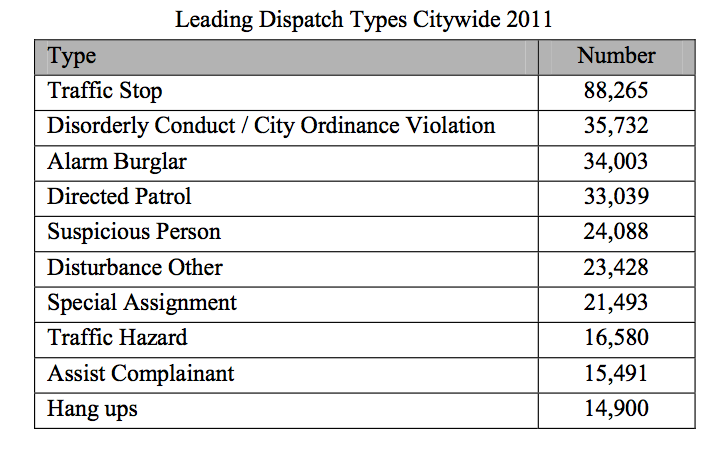 Saturating the City with patrol cars can potentially improve the response time to “high-priority” calls (e.g. domestic violence or other violent assaults that are in progress). Unfortunately, the PERF study simply alludes to this potential decrease in response time without any actual figures. There’s no model of how an increase in staffing might impact response times, much less if that decrease in response time is of public value given opportunity costs. Patrol officers spend a lot of time enforcing order on roads given our car-centric transportation policy. And when they are not enforcing order on roads, our patrol officers are driving on those roads to answer calls over sprawling sectors. Sprawl also makes it harder to productively use “uncommitted time”, as officers have to drive and park to their community sessions, eating up valuable time. Thanks for reading “Patrolling Police Spending”. Want to make a comment? Comment on Facebook.